I went to nursing school after forty years of restless exploration. In college, I majored in Forestry. 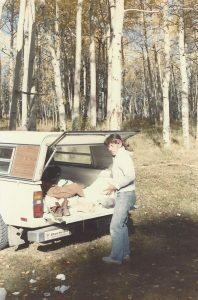 After graduation, I did forestry work for a few years but got tired of camping out in the back of my little Toyota pickup 9 months out of the year with my dog, Joanie. I’d shower at the KOA on my weekly trip into town, most nights warming my hands over a Coleman stove and eating a bean mixture I called “fart swill”. I lit candles when my flashlight batteries died. Then the rain would leak through the camper shell roof and snuff them out. When the water jug froze overnight and didn’t thaw out by noon, I’d move to a ski town, get a job or two waiting tables for the winter and enjoy the luxury of sleeping on a futon pad on the floor of an oversized closet, daily showers, and hot water in a dilapidated Victorian for $50 a month. I’m not a skier, I’m a runner. 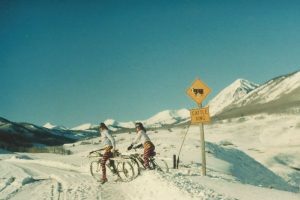 I did one winter in Steamboat Springs and then I discovered Crested Butte. I ran and mountain biked the plowed roads and snowmobile tracks during ski season, then on psychedelic wildflower-lined trails up and down the mountains in the summer. I decided to go back to graduate school so I could teach. I got a Ph.D. in recreation, studying health benefits of leisure, heavy on the physiology, and social and cognitive psychology. I taught exercise science for a couple of years at the college level, but it was a path I couldn’t follow. It blew out my candle, being held to expectations of playing the men’s game, by the men’s rules, when no one would tell you what the rules were if you were a woman. I had to follow my own light. Somehow, I never felt settled into anything, but I was seeking something. I started a personal training business working with older women with chronic health conditions, which was challenging and rewarding. It was then I realized I needed a healthcare background. I checked into nursing and PA school and decided nursing had more options. I went through a rough time in my thirties. I struggled with unexplained fatigue for months, I couldn’t read because I’d forget what the first sentence said by the time I finished the paragraph. I finally found out I had thyroid disease, but it took five doctors to get that straightened out. Then I applied to nursing school. My first healthcare job, as a part-time CNA on a hospital medical oncology unit, paid for school. My first nursing job was ICU, where I stayed for four years, before switching to outpatient oncology/infusion. The ICU bedside was grueling and stressful. In oncology, I had time while tapping ports, drawing labs and hanging chemotherapy, to listen to patients. Still, I couldn’t stand the oppressiveness of nursing work in the hospital. I felt like I was in a cage. No matter how hard we worked, it was never enough. You can only multitask so much before you become a robot. Every day I’d go home feeling like someone sucked all the contents out of my head, body, and soul with a super-powered vacuum. They just wanted to pile work on nurses, expecting them to complete tasks, and not to question or invent anything new. What people needed wasn’t being addressed in healthcare. I decided that with my skills and background, I was the ideal person to do something about meeting those patient needs, except that was never going to happen within the four walls of a hospital. They didn’t take risks, didn’t want to listen to anyone who thought beyond easy reimbursement. Some nurses will sit and take it, complain, and make excuses. “I could never leave my job, I have a family, I have [this situation or that situation].” They’d recite every excuse in the book, as if they were unique, as if their personal situation forced them into martyrdom, and wore it like a badge, while they enabled the institutional abuse that sucked the life and light out of them. Well, you might not be able to do it all at once, but you do have choices. You can take baby steps, and you can dream. When you allow yourself to roll over and play dead, you will be stepped on, your light snuffed out like a candle under a leaky roof. I left to go on my own and started Sunspirit Wellness Services. I first developed a program called FIERCE to offer as an active support group in the community, as an alternative to the talk support groups. 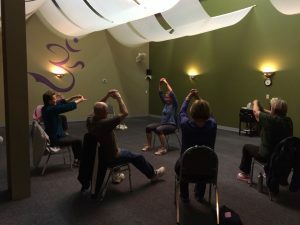 The purpose was enjoying movement and activity in the company of other cancer survivors, with opportunities to learn about different therapeutic modalities. Then, based on the number of similar questions and issues I heard from cancer survivors in the community over the years, I developed an education program called Cancer Harbors®. Nursing prepared me in the clinical knowledge and actual bedside and chairside work with the patients, seeing what they went through in treatment, but it wasn’t enough. It did not show a picture of the consequences and outcomes in everyday life for patients. Now, I speak to a lot of groups and have learned that people are not highly motivated to change. Sometimes I think they don’t believe in themselves as if many of them have had the candle snuffed out. Some of it is a distraction, some despair. If they think nothing they do will make a difference, they don’t try. I have scant evidence, but I think there a lot of illness is steeped in that attitude. At the same time, many of them don’t have the skills to make changes. It hasn’t been easy when I first I launched Cancer Harbors online, it flopped, big time. The program has been picked up by a local nonprofit here where I work with breast cancer survivors after treatment. I’m writing the book, finding freelance projects, and writing a chapter for a textbook on cancer survivorship. Trying to get doctors to listen was another exercise in head-bashing. Sometimes doctors don’t see the value because I don’t do things the way everyone else does them. Getting the mainstream world to accept or embrace a different approach is the ultimate chore, but I refuse to be locked in a cage, have my flame extinguished. I would rather die. When physicians don’t have the bandwidth for new ideas, it’s usually because their schedule doesn’t allow time for learning about something that has yet to be tested empirically, or they simply don’t see it as related to what they do. They fail to see the connectedness of treatment and recovery. No one becomes responsible for cleaning up the mess. People want to be listened to. They want validation that the pain they feel exists, even if the doctor can’t empathize or offer them relief. It’s not enough to say you’re doing something, you actually have to do it. A survivorship care plan only sees the patient in terms of follow-up visits. There’s a person who exists in the time and space between those visits. I want to work with people who are willing to put forth the effort to reap the rewards. I cannot give you hope, only you can find it within yourself. You might need help lighting your flame, but you need to keep it lit by reaching out for support. There is light in everyone. I keep my own light burning by doing what I love. I love to write. I’ve had a running blog for ten years, a thyroid blog, a food blog, and my work blog. I’m writing a book now about how we “do” cancer survivorship care in this country, and how we can all do better: patients, doctors, nurses, administrators, policymakers, and ordinary citizens. I find freelance writing jobs when I have time. I also love to run. 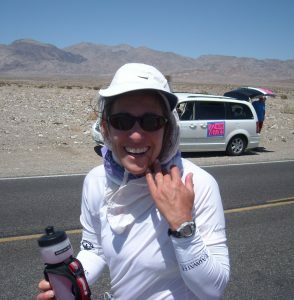 I ran 270 miles across Death Valley and back in 5 days, in 120-degree heat, in July. One day, plus a few hours, I ran 114 miles around the Everglades in alligator country. I’ve run through deserts and mountains, on both coasts, in the South, Midwest, Black Hills, Grand Canyon, and across the Florida Keys from Key Largo to Key West. I’ve run roads, trails, and tracks for days, in straight lines, out and backs and loops. If you see me running around in circles, leave me alone. I’m happy. I hope I will be able to educate people to pay attention to something they don’t see an immediate need for. Getting people to change their ways- doctors, patients, nurses, anyone- it’s an uphill battle. But one thing ultra distance running has taught me is RFM, which means relentless forward motion. The few times I’ve thought I might have to get a job, I think about waiting tables because really, that’s so much easier than being a nurse. The shifts are shorter, you don’t have to document anything, no one’s life is on the line, you can use the bathroom or eat if you need to. Instead of meds, passing trays of food; instead of bowel prep, delivering margaritas. I want to see the sun rise and set most days, and be outdoors as much as possible. These days, I don’t accumulate airline miles. I do most of my miles on my feet and the keyboard, but I can sleep, I can feel good about the work I’m doing every day without a sense of dread as I punch a clock. Some days I still wonder, has the light burned out in everyone? It requires believing in yourself, and in mainstream nursing, we fail to impart that confidence. I can only hope that I can light other burned-out candles along the way. But even if I only light one, it will be enough to find the way forward. Alene Nitzky, Ph.D., RN, OCN is an oncology nurse-turned free agent, writer, ultra endurance runner, Australian Shepherd mom, pastel artist, and entrepreneur. She is CEO of Sunspirit Wellness Services, LLC, Founder of Cancer Harbors® and FIERCE: Functional & Fit, Independent, Energized, Restored, Confident & Empowered®. When she’s not moving forward on her feet, her hands are typing or full of puppy fur. She believes every day is an adventure.